I’m an ocean swimmer. 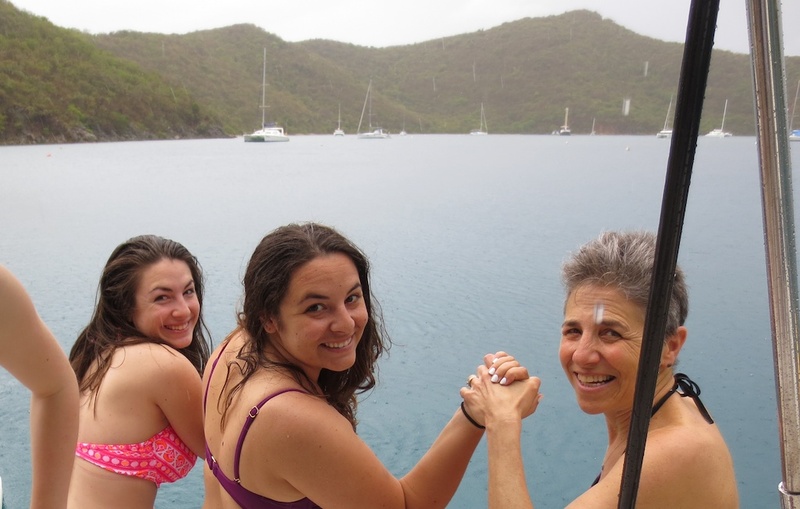 It wasn’t a question of whether I would swim during our week in the British Virgin Islands; just how often. Trading the efficiency of swimming goggles for the underwater vision provided by mask and snorkel was an easy decision in the British Virgin Islands. Isabel's birthday. Gray, with intermittent rain squalls. We are going to get wet anyway, and I won’t need the wetsuit I wore for the last six months in Rhode Island. "Hurry up. It's raining and we're getting wet." The water is refreshing, as expected. Cool but nice. Then soon enough, the water feels warm compared to the air above. We don fins, snorkels and masks, and swim toward the shore. The water is a bit cloudy but we still see beautiful blue fish, plus a fish whose scales look like harvest corn. When the girls head back to the boat, I switch to my goggles and swim out of the cove and back, about half a mile, and set a new plan for the week. I will only swim with the snorkel and mask from now on so I can see the fish better. A little later (after they take a morning nap), we put on our snorkeling equipment and pick up a mooring at the caves. John sets me up with a head mount for his Go Pro camera; then Olivia, Sophie, and I set off. As expected, the water is crystal clear, giving us great views of several different kinds of fish swimming off the coral reefs. Sebastian warns us to avoid touching the fire coral. 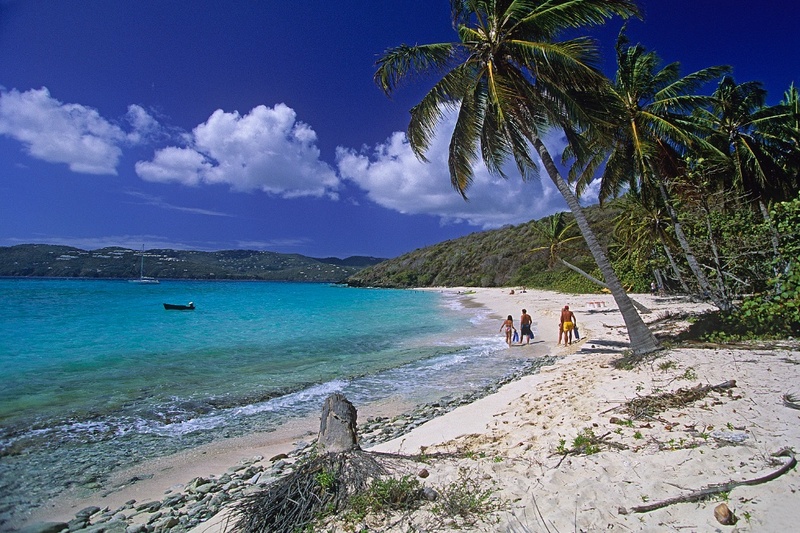 Whether at the Caves at Norman Island or Sandy Spit (shown) near Jost Van Dyke, the British Virgin Islands welcome you to the water. I love snorkeling for many reasons, but mostly I love how peaceful it is. All kinds of fish swim easily around humans, accepting us foreign creatures in their territory and moving on. We could learn a few lessons from them. Not far from Jost Van Dyke, we drop anchor and dinghy over to Sandy Spit. Olivia and Sebastian stay on the beautiful sandy white beach on the Spit while Isabel, Sophie and I snorkel to nearby Green Cay. I am psyched to get some good footage with the GoPro this time. The variety of fish are similar to the caves at Norman, but the reef is bigger so the swimming is more interesting and the number of fish, greater. I see rainbow fish, yellow fish with big eyes, electric blue fish, harvest corn fish, beautiful purple fan coral, and Black Sea anemone. 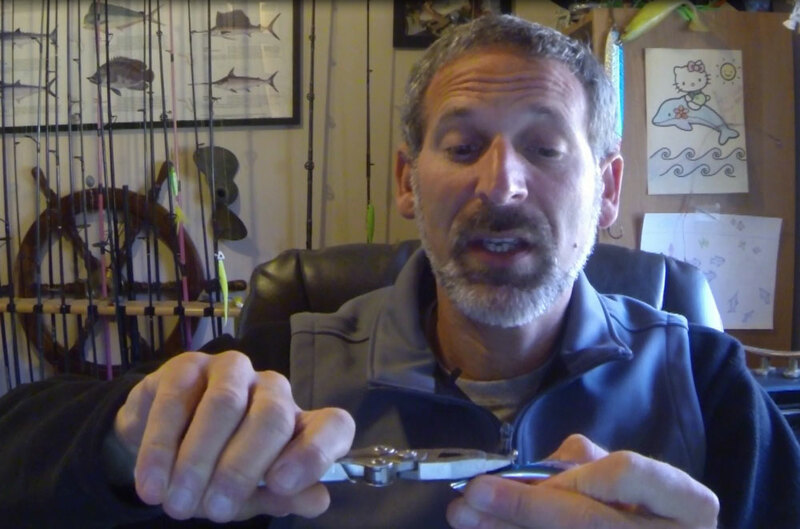 Sadly, the GoPro doesn’t catch the intensity of color or detail of the fish. 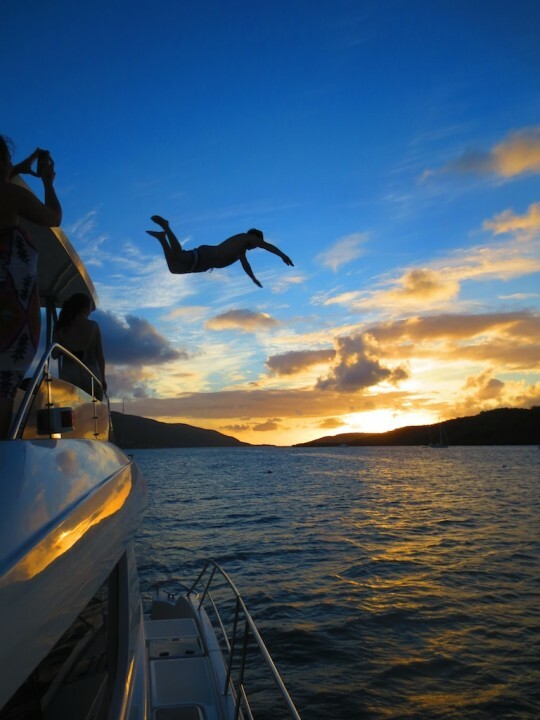 That afternoon, after sailing to Scrub Island, we do some swimming of a different nature. The resort has a hot tub, showers, poolside bar, and water slide, so our first visit is to the bar for six bushwhackers, then Isabel, Sebastian, and I take a few turns down the water slide into the small pool. Refreshing. A different swim style: Relaxing at the in-pool bar at Scrub Island Resort. 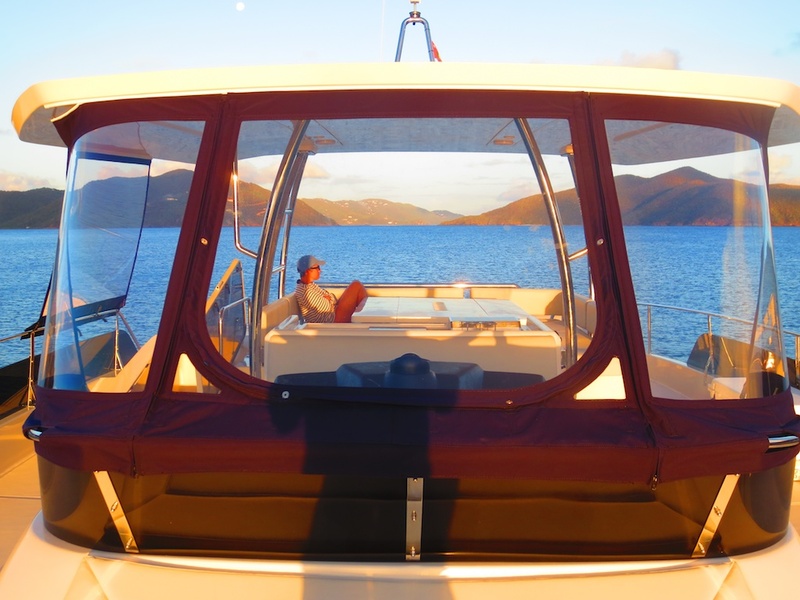 We sail to Hodges Creek to make the switch to our new boat, the MarineMax 484 power catamaran. 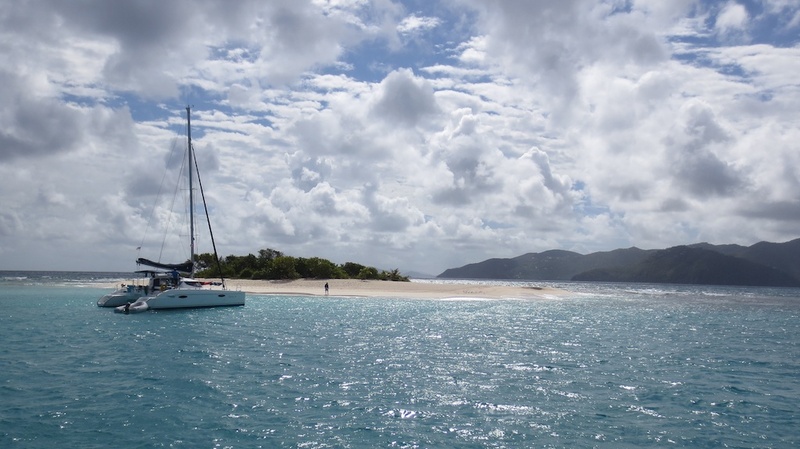 The switch takes a while, but we finally leave the docks in time to get to Virgin Gorda in the late afternoon. 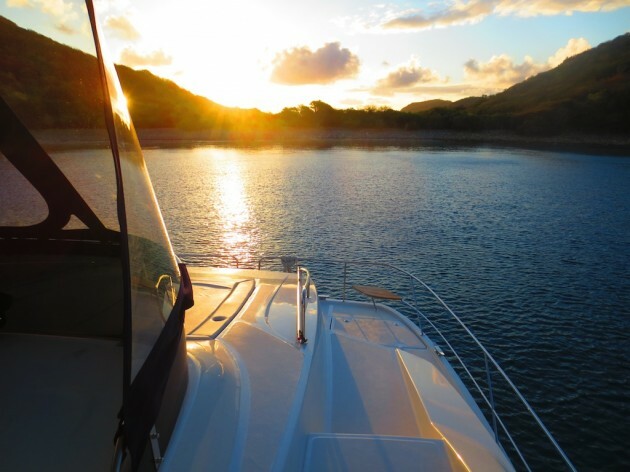 Except for a quick dip at sunset, water activities will wait for tomorrow. 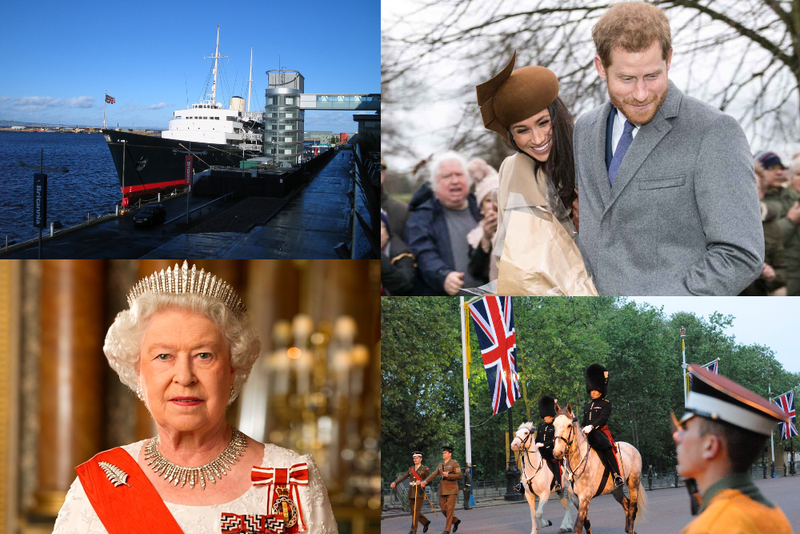 Rachel and John swoosh by the photographers on the stern of the charter cat. 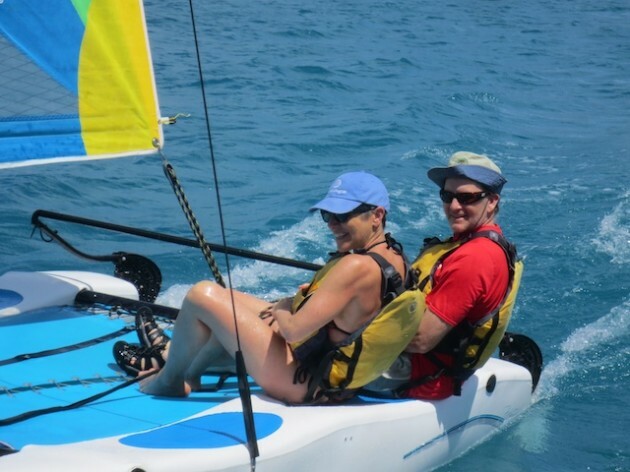 The best water day of the week starts with some great Hobie cat sailing skippered by John. I take a spin on one of the Bitter End Yacht Club’s stand-up paddleboards, then swim to our boat from the dock. Without my mask or goggles, I can’t vouch for the sea life in North Sound, but the water feels perfect on my skin. 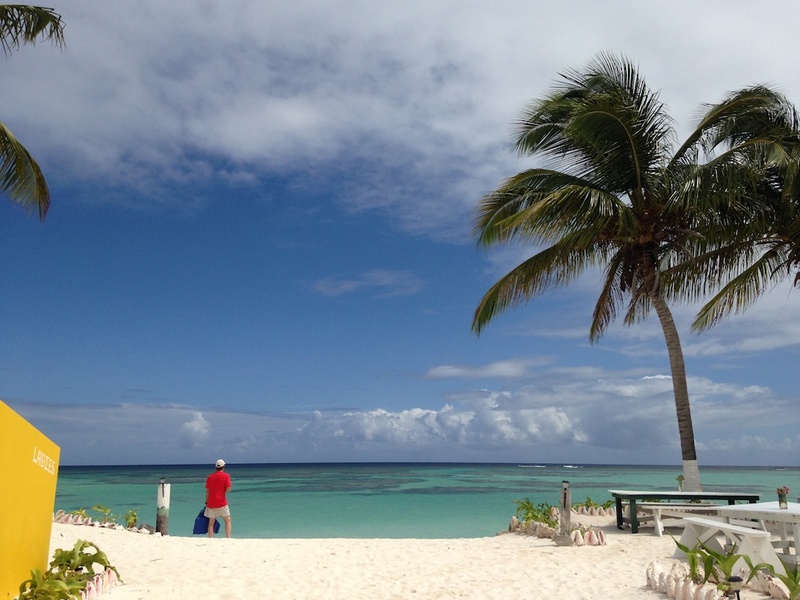 We motor to Anegada midday and arrive just as a rain cloud floats by. 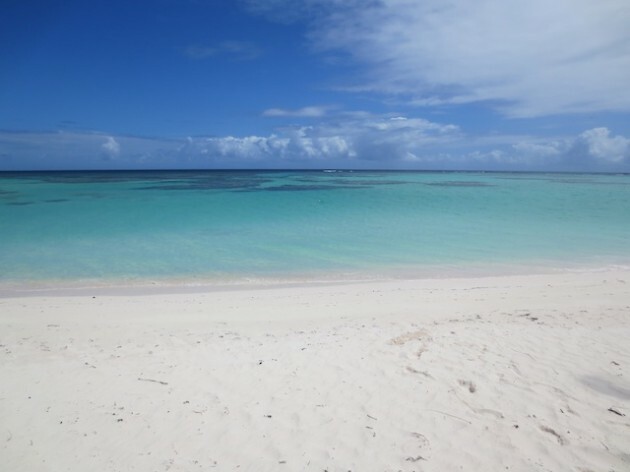 Outside Anegada's reefs, the deep blue Atlantic. Inside, an underwater playground. Time for an excursion to Loblolly Beach on the far side of the island aboard three scooters. Under partly cloudy skies. Sophie, John and I snorkel amongst the reefs, which are plentiful. We see many of the same fish we'd seen earlier, plus an angel fish that keeps following us. The coral seems dead compared to previous snorkeling trips. Maybe it’s my imagination but the colors seem less vibrant. In the morning, John and I rent a scooter again and ride to Cow Wreck Beach while the kids snooze. What a beautiful pristine beach, with glorious colors in the water. 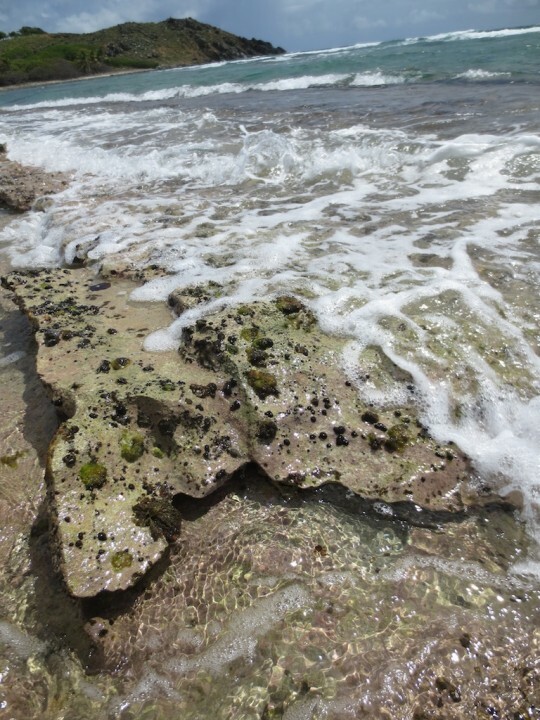 We were told the snorkeling wouldn’t be as good as at Loblolly, and it’s true, but we still see fish around small coral outcroppings and amidst the sea grass. As we walk back along the beach, we startle a ray in the shallows; standing still, we wait, and it circles back around for our cameras. We agree, the beach deserves its reputation as among the most beautiful in the world. The road is sandy and a bit tougher to reach on a scooter, but worth the trip. 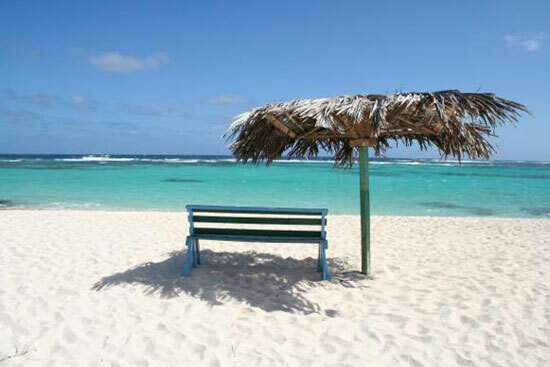 Gorgeous turquoise waters at Anegada's Cow Wreck Beach. 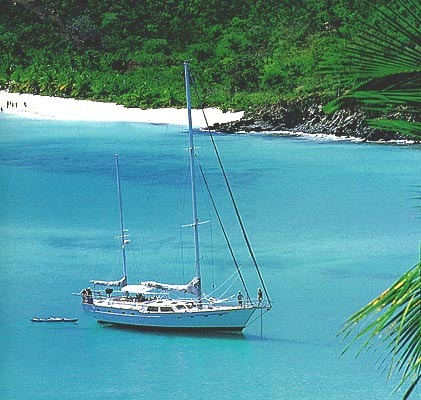 After breakfast, we head to Great Camanoe Island and drop our anchor in beautiful Lee Bay on the west side. We are the lone boat, which seals the deal. 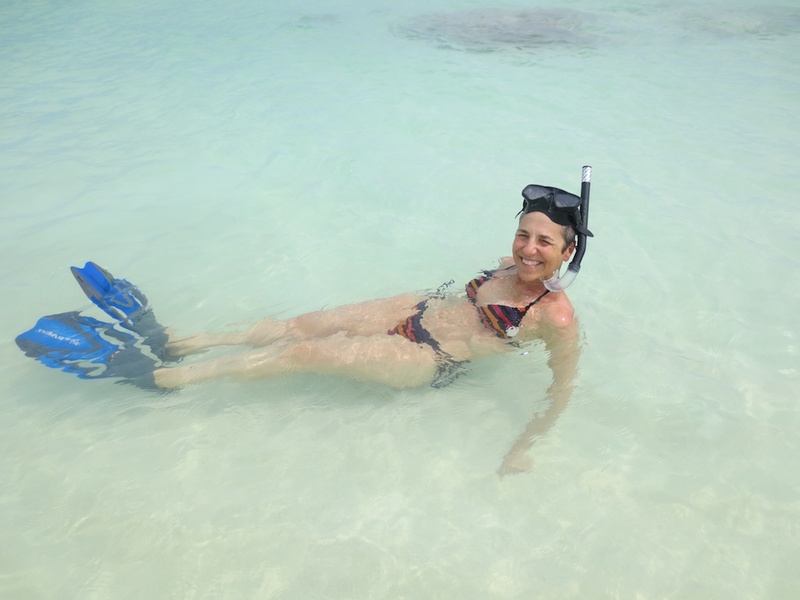 I snorkel twice in the afternoon—once alone, then again with John late in the day. We enjoy the depth of the water by the cliffs, plus more of the same fish and spectacular purple fan coral. Two boats join us by the end of the afternoon but the anchorage is big enough for three. I find special pleasure in watching the pelicans dive for fish, followed by the gulls eager to make off with any scraps. Sunrise in Lee Bay. A gorgeous final morning in the BVI. Awake early, at 5:30, to enjoy as much of our last day as possible. I brew coffee and prep for breakfast, then set out to snorkel one last time. It’s amazing, and shy of the Galapagos, this becomes my favorite snorkeling area. The light from the morning sun makes everything crystal clear, set against the shadows cast by the rocks and coral from the cliff above; then into the water and 15 to 18 feet down to the ocean floor. As the sun rises on the upper deck of the MarineMax 844, the author contemplates one last swim. Between the light and the thousands of small fish swimming along the coast creating underwater whirling dervishes, I am mesmerized. At one point, I begin to swim between two rock formations, estimating I will just fit through without touching any of the fan coral, when suddenly I spot what looks to me like a barracuda, positioned exactly where I am heading. I put on the brakes and shift quickly into reverse. I pop my head out of the water and notice a pelican sitting right near me on a rock, waiting for his next flight and picking his next spot to dive. Thankfully, human heads aren't appealing to pelicans. On my return, I approach the same spot where I wanted to swim between rock formations and my barracuda friend is still there. Just hangin’. I continue along the rock wall and back to our boat. I take off my fins and decide to swim out a bit since I haven’t done much straight swimming this trip. I realize why. I love to swim but in the Caribbean, I'm more interested in exploring the underwater life. I'll get plenty of swimming back home. I love my morning snorkel today because I am completely present. I am happy being right where I am, and experiencing the depth of that happiness. I know I'm creating one of those memories that I can always come back to—surrounded by water and exquisite sea life, moving my body in a dance with the natural world.